Air France / KLM flights to Johannesburg from Switzerland €393 or Ireland €339! Star Alliance carrier Lufthansa has released an interesting solution from Italy to Mexico. 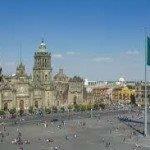 Return flights from Milan, Venice or Rome to Mexico City or Cancun are now available from €369! Promo tariff is inclusive of all taxes, meals and hold luggage. Need a solution to this usually very expensive destination this is good option not just for travelers in Italy.. All charges and fees are included in base fare. Flights have one layover in Frankfurt on your way.. If interested in this Air Canada / Lufthans promotion look for flights departing from December 2018 to June 2019. Max stay 3 months. This is kind of flash sale as discount is applicable to bookings made till 26th of November. Below you can refer to our booking sample from all Italian cities. Important: Price shown is valid when making your purchase at website of the airlines using €30 Lufthansa promo code – ZA6UBEOMAFOD. Enter this code in last step “Choose Payment method” during the booking process. Booking sample of cheap return flights from Italy to Mexico City from €369! In this case you would depart from Milan to Mexico on 3rd of March. Your return flight from North America back to Europe would be on 17th of March 2019.